NO COST PRINTERS AND PRINTER SERVICE! It’s true! You receive printers and printer service just for buying our toner! All you provide is the power and the paper. Plus, you’ll receive expert advice to select the right printer(s) for your needs and our optional remote monitoring service to proactively replenish toner, so you never run out. Finally something that is both too good and true! Please fill out the form and get a conversation started! Our disruptive approach to traditional business printing eliminates the need for your company to buy or lease printers and pay extra for printer service / repairs when you use our premium quality toner cartridges. For over 20 years, we’ve helped businesses like yours reduce your print related expenses and avoid time, expense and frustration associated with your office printing, so you can focus on what you do best. * Savings based on online prices shown for HP LaserJet Pro M281fdw all-in-one wireless color laser printer, $349.99 and HP 202A black, $66.99, HP 202A cyan, magenta and yellow at $79.29 each. Price taken 8th Jan 2019 online at Staples.com. Total printer cartridge savings calculated on a 30% saving when buying a set of Cartridge World black, cyan, magenta and yellow cartridges 8 times over a 2 year period. On site printer service savings based on $300 per year including parts and labor for 2-year term. + Savings based on online prices shown for HP Color LaserJet Pro Mfp M477fdw printer, $429.99 and HP 410A black, $91.99, HP 410A cyan, magenta and yellow at $120.99 each. Price taken 8th Jan 2019 online at Staples.com. Total printer cartridge savings calculated on a 30% saving when buying a set of Cartridge World black, cyan, magenta and yellow cartridges 16 times over a 2 year period. On site printer service savings based on $300 per year including parts and labor for 2-year term. † Savings based on online prices shown for HP LaserJet Pro M570DN multifunction color laser printer, $1099.99 and HP 507A black, $164.99, HP 507A cyan, magenta and yellow at $245.99 each. Price taken 8th Jan 2019 online at Staples.com. Total printer cartridge savings calculated on a 30% saving when buying a set of Cartridge World black, cyan, magenta and yellow cartridges 12 times over a 2 year period. On site printer service savings based on $300 per year including parts and labor for 2-year term. Your printer is going to break down! 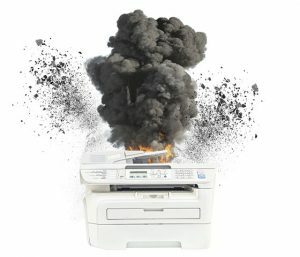 50% of workers state that their office printer breaks down once a month – not including paper jams, dried cartridges, and driver update bugs. Imagine never having to worry about printer repair or maintenance again? At no cost?